I feel her arms around me today. Today, on what would have been her 95th birthday. 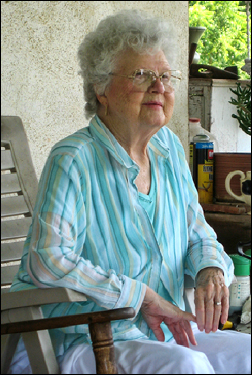 Third-born child and oldest surviving daughter of my grandparents, Eula Cladyne (Cottrell) Barrett was born in Colorado City, Mitchell County, Texas,1 the only one of my grandparents’ 12 children to be born there. At 18, she married Leo Cy Staples in Midland,2 bore him one child, my oldest cousin Bobette,3 and then they divorced.4 She returned home to her parents in Midland. That’s where the Great Drawer Swap occurred that resulted in some of my cousins becoming Barretts. My mother was the next oldest daughter and, when Clady moved back into the house, had been compelled to share space with Clady and little Bobbi. That was okay, but what really stung was losing the rights of the oldest girl child to a whole unshared dresser drawer. Clady got that, and my mother had to keep her things in boxes under the bed. I have so many memories of my Aunt Cladyne — Clady, as she was called for short. But today… today, for some reason, it is one that sticks in my mind — and in my heart. And I feel her arms around me today as I felt them then, on what I remember so vividly as a terrible day. I was perhaps 12 or 13 years old, maybe even a year or two older, and we were visiting Barrett and Clady at their home in Williamsburg, Virginia. And my parents decided that was the time and place for yet another of the rows that ultimately ended their marriage. And it ended with my father storming out of the house into the pre-dawn darkness. We didn’t know if he was ever going to come back. And we didn’t know if him not coming back was what would have been better at that point. It was that bad of a fight. And I basically lost it. I had had just about enough, thank you very much, of just about everything. Enough of the yelling, enough of the hitting, enough of the drama, just enough. Imagine, if you will, a house that was crammed to the gills with people. At least three of the Barrett kids (not sure if the last one was born yet). At least five kids from my family. All of the kids upset. My mother trying to calm her younger kids and my littler cousins as upset as my siblings. Now add into the mix one fundamentally hysterical pre- or early-teen who was, even then, pushing six feet in height. It would have been easy for the adults to vent some of their own anger on this older kid who should have been able to hold it together. It was the norm in our family that the focus would be on the younger kids, with the older ones expected to pitch in. I couldn’t do it. And I remember the despair I felt, that I was just making it all so much worse. That’s when I felt her arms around me. My even taller aunt pulling me into her arms. I don’t remember any words. I don’t remember any “come let us reason together” efforts. What I rememember, as vividly now as I did then, was that I felt her arms around me. My Aunt Cladyne simply put her arms around me and held me. Held me as long as it took for me to calm down and get myself under control. Held me as long as it took for me to understand that — even in the midst of the yelling and the hitting and the drama — there still was love. Held me as long as it took for me to know that — no matter what — there would always be love. Held me as long as it took for me, finally, to feel her arms around me, her strength around me, her love around me. Why that memory surfaces today, so many years later, I don’t know. Except that it lets me feel her arms around me today. Today, nearly seven years after we lost her. And I’d give anything for one more of those hugs. sigh. great story telling, and great emotions, as always. I’m so proud to carry her name in mine. I could feel the emotion in this one Judy. My Mother had 4 sisters in her family, giving me 4 wonderful Aunts. During the war I stayed with all of these at one time or another. Even though they had children, I felt loved as much as when with my Mother. Aunt’s are so special or at least they were in my family. Aunts do play a special role in our lives, don’t they? That chokes me up. Thank you for sharing this. I love your stories that make me cry and rejoice at the same time. A hug from me! I danced with my mother about 2 weeks ago at our daughter’s wedding! I danced with my daughter and wife too! She will be 95 next month. . .Only trouble is a fall has put her in the hospital but we have been through this before! She’s a tough old girl! Hope she recovers soon and fully. Good for you for having that dance. What a beautiful memory – thank you so much for sharing it with us. We all need a Clady in our lives.